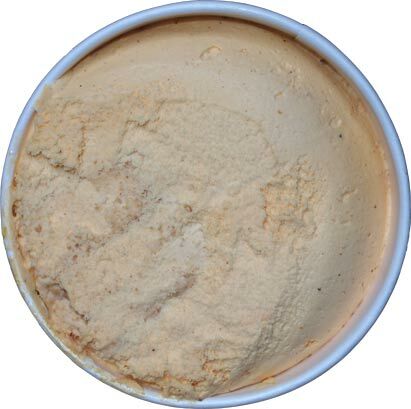 I never really have a huge craving for pumpkin ice cream, and I'm definitely not a fan of Edy's / Dreyer's light ice cream texture, but several of you pointed out that this one isn't that bad. Typical Edy's uninspiring fill job, but I think I see graham swirl. 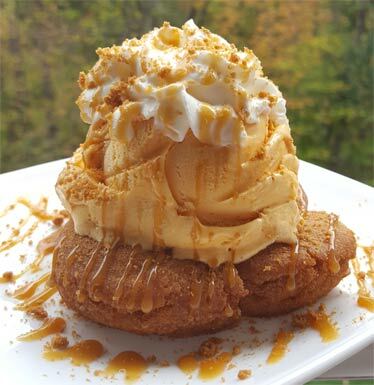 In the interest of full disclosure, I must point out that my first serving went in to this delightful pumpkin donut sundae. The donuts are quite blah (what can I say, they were 99 cents for a dozen), but the ice cream and caramel really brought them to life. This sundae was very enjoyable. On Second Scoop: I've been stealing a bite of this one here and there and I can actually sum it up pretty easily. 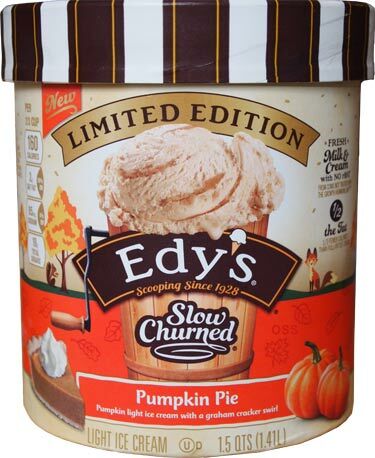 It's typical Edy's texture and a good amount of pumpkin flavor, but overall it leans a little too heavily on the cloves. The graham swirl is fine and does help elevate this from their old pumpkin flavor, but because this is part of the slow churned line up, so there's not going to be a ton of it. To sum it up, if you feel like checking this one off the bucket list, go for it, you could do worse. Where do you buy a dozen of donuts for just 99 cents?! 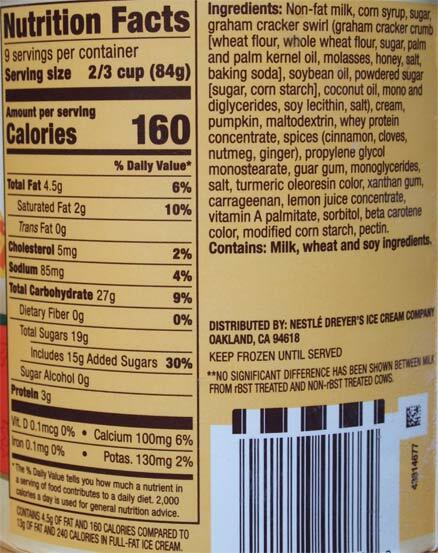 Interesting they changed the serving size from 1/2 cup to 2/3 and then decreased the number of servings from 12 to 9. I wonder if they're going to do that for all their flavors. Market Basket! They are smaller than regular donuts (90+ calories a piece) and they come in a long thin box. I see a similar branded product at other stores for like $1.99 (or $2.49?) sometimes, but MB carries them at 99 cents. They aren't amazing, but definitely satisfy in a pinch, especially if you grab the freshest box. When you first open that fresh box, mmmmm, they hit the spot. I think this ice cream is good for what it is. My favorite pumpkin ice cream is Ben and Jerry’s pumpkin cheesecake. I also like Talenti’s pumpkin pie. I know Tillamook isn’t widely available, but for those who can get it, I would highly recommend the pumpkin cookie butter. I like to put Trader Joe’s pumpkin ice cream between two of their triple ginger snaps. That is my attempt to recreate a pumpkin ginger mouthful. 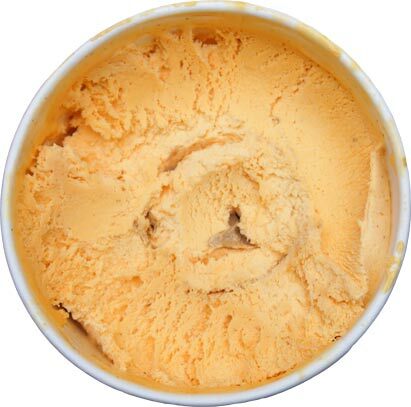 I’ve heard negative comments about Graeter’s pumpkin ice cream - but I think it’s good. @Eric: graham makes everything better. would you consider adding a little caramel as well? @Anon: funny, graeter's is one of the few I haven't had! I should keep my eyes open for it. Also, I would love to try that pumpkin cookie butter flavor. I haven't tried it with caramel, probably because I didn't have it in the house, but how could that be bad! I bought the Graeter's version in Whole Foods. I normally wouldn't pay that much for it - but I was curious enough that I decided to splurge. 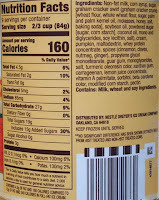 I wish you could try the Tillamook pumpkin cookie butter. It really is good. Their peppermint bark is also quite nice.